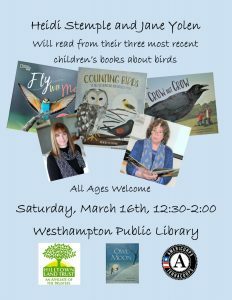 Hilltown Land Trust, Kestrel Land Trust, Arcadia Wildlife Sanctuary, and the Westhampton Public Library are pleased to present an event with local authors Heidi Stemple and Jane Yolen. This successful mother/daughter team will discuss three of their most recent books- Counting Birds: the idea that helped save our feathered friends, Crow Not Crow, and Fly With Me. In addition to their delightful bantering related to their family’s love of birds, Heidi and Jane will read poems and excerpts from these books including the entire text of Counting Birds, Heidi’s award-winning children’s book. Also, Heidi will demonstrate her exceptional owl calls and offer an opportunity for members of the audience to practice their own. If time allows, Jane may read from Owl Moon. Books will be sold and autographed after the presentation. This event is offered free-of-charge but donations to any of the organizations collaborating to put on this event are always welcome. Westhampton Public Library is a wheelchair-accessible building. RSVP is not necessary but always helpful. To reserve a spot, contact Susan Schroder at 413-628-4485 x4 or email her at HLToutreach@thetrustees.org.